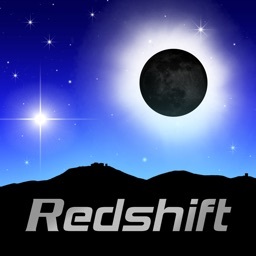 Children and adults alike will be smarter than their peers after playing this collection of eclipse-themed quiz games. Learn about the celestial event itself, as well as the path of the Great American Eclipse. 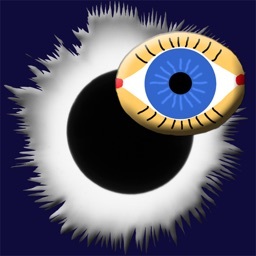 Prepare for a spectacular celestial event! 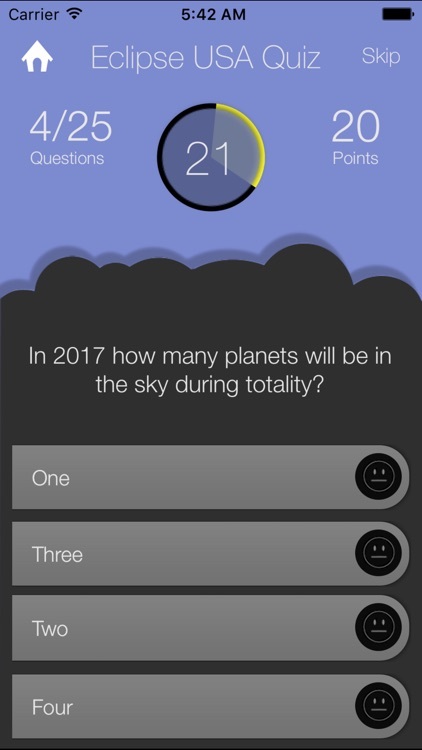 I guarantee you, if your children play this quiz game, they will be the smartest students in the class when their teachers start talking about the Great USA Total Solar Eclipse! Parents, you will be the smartest adult in the neighborhood and may even get inspired to lead an entire group of your friends to the Path of Totality! The 2017 solar eclipse will cross the entire continent, from Oregon to South Carolina. Missouri Special! - You're In The Path! 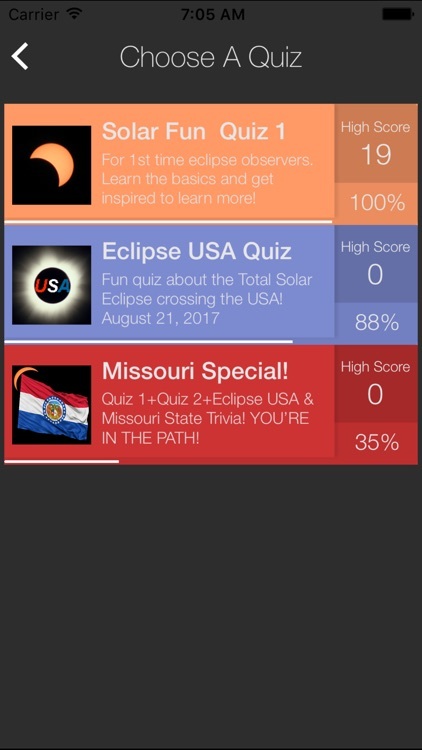 I have observed 3 previous total solar eclipses and the Solar Eclipse USA Quiz Game was developed and authored to help the public prepare for the August 21, 2017 Total Solar Eclipse. 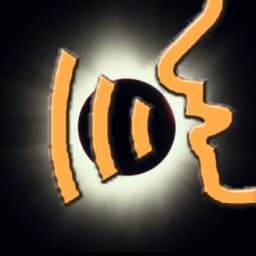 All of the total solar eclipse images in this app are my personal images. The questions are presented with a 30 second timer. Points are awarded for correct answers and points are deducted for incorrect answers. Correct answers have immediate feedback with a pop up cloud that provides additional educational information! When starting a new game, you are presented with a random selection of either 25 or 30 questions from the category. Additional game starts in the same category will have some questions repeated, but the app keeps track of what questions are presented and you will eventually see 100% of the questions in that category. You can play categories as many times as you want, it will always present the questions randomly. Solar Fun Quiz 1 - has 50 basic solar eclipse questions that will provide an excellent foundation of knowledge about eclipses. Eclipse USA Quiz - has 25 questions about the path of the 2017 solar eclipse across the country. The app offers in-app purchases for more categories. 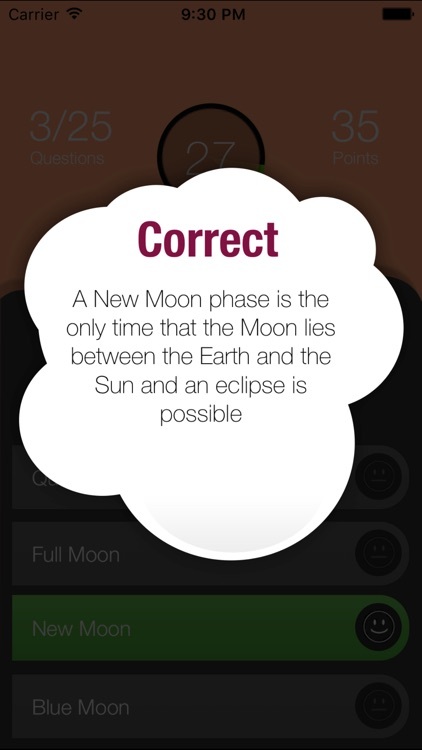 Eclipse Pro Quiz 2 – The reason to get this quiz? 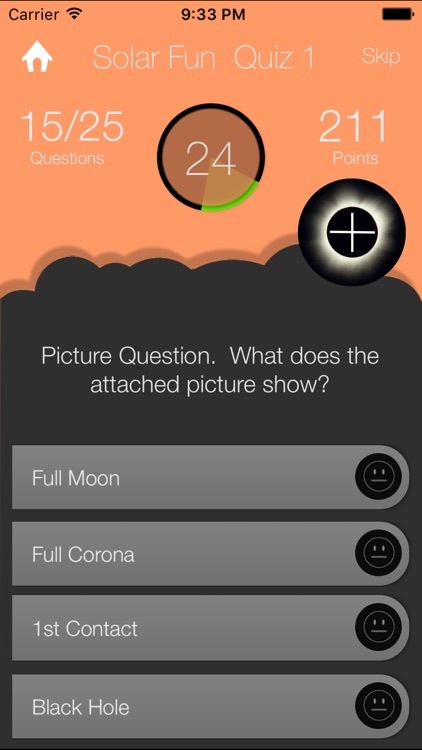 If you want to be challenged, and learn even more about solar eclipses, this is a separate quiz game with 60 more advanced questions. Totality – The reason to get this quiz? 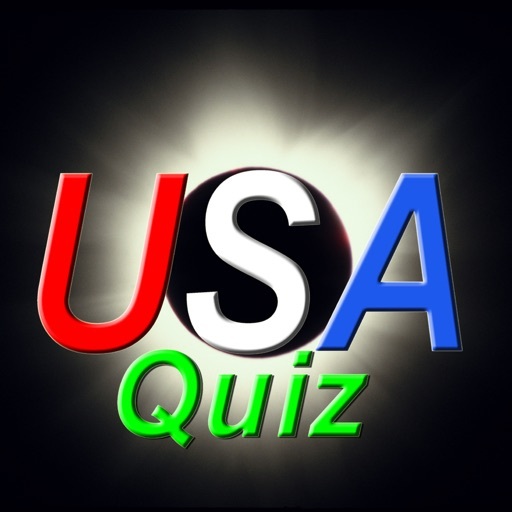 This quiz game COMBINES the questions from Quiz 1 and Quiz 2 and Eclipse USA together. 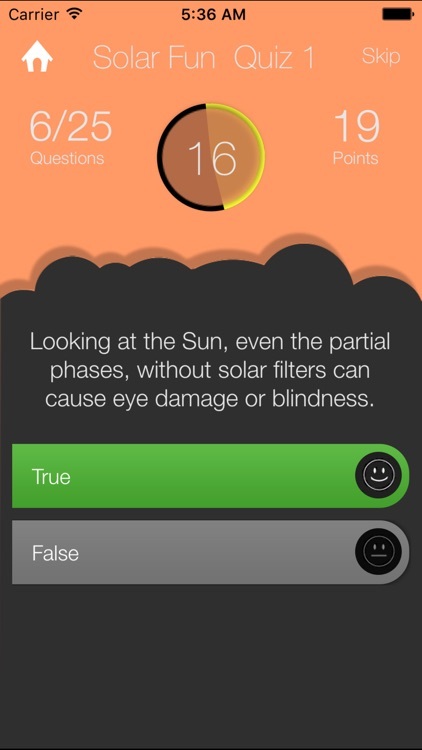 So it mixes the basic and the hard questions, and adds the fun eclipse path questions. Great fun for the family! The game will randomly pick from 135 questions presenting 30 questions at a time. State Specials! – The reason to get this quiz? For all of you LUCKY people who live in a state that is IN THE PATH OF TOTALITY, here is a special treat: State Specials! Separate quizzes dedicated to each of the 12 states that are in the path of totality. The State Specials COMBINE all of the 135 questions that are in the Totality quiz and then adds 20 trivia questions specific to that state. The lucky states from West to East are: Oregon, Idaho, Wyoming, Nebraska, Kansas, Missouri, Illinois, Kentucky, Tennessee, Georgia, North Carolina, South Carolina. My main project to prepare for the 2017 eclipse was to re-program and re-release my Solar Eclipse Timer app. This is the original solar eclipse “talking timer" that has voice announcements to guide you through an eclipse. 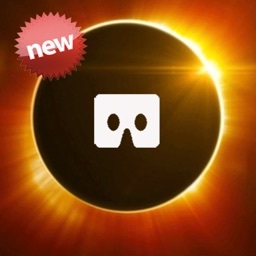 This is the "Crown Jewel" of solar eclipse apps. It will help get you to the path and then talk you through the entire eclipse. You won't miss a thing. 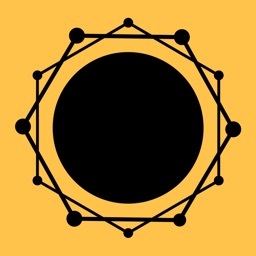 For more information find the app on iTunes by searching for Solar Eclipse Timer. Visit my website for more total solar eclipse information. Educators: Although this game is Copyrighted with All Rights Reserved. I ENCOURAGE TEACHERS THROUGHOUT THE COUNTRY TO USE THE GAME AND THE QUESTIONS TO TEACH STUDENTS ABOUT THE ECLIPSE (the use must not be commercial or for profit). I would appreciate you acknowledging the Solar Eclipse Timer app. Thank you for using this quiz game! USE PROPER EYE PROTECTION DURING THE PARTIAL PHASES! Do Not miss this opportunity to see this Total Solar Eclipse! Please Get Into The Path Of Totality! You will never forget the experience!